In this video Dr Greg Mannion (The University of Stirling) and Adam Park (Cornton Primary School) tell us about Geocaching and how it can be used in Science Education. In this innovative, outdoor, practice-oriented project, we brought together innovative ideas within science education and education for sustainability to develop a new approach to geocaching. Geocaching is a real-world, outdoor treasure hunting game using GPS handheld navigation devices (a bit like SatNav for walkers). Participants navigate outdoors to a specific set of GPS coordinates and then attempt to find the geocache (a small sandwich box-sized container) hidden at that location. 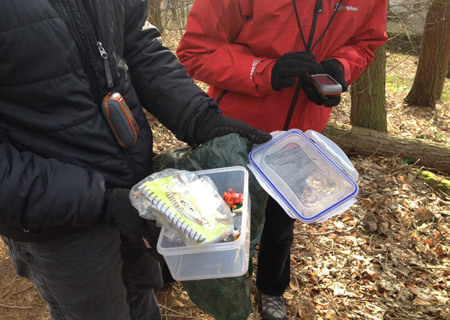 A cache always contains a logbook, and some other small token items. Geocachers usually log their finds on-line and can create new caches too as part of an international community. Geocaching is a lot of fun but not normally purposefully educational or science-focused. In this project, we set out to work with teachers and pupils to enhance geocaching to make it focused on purposeful and place-sensitive through scientific inquiry. Our approach, was to bring three ideas together: outdoor place-responsive pedagogies, inquiry-based science education, and education for sustainability. The project has developed some key understandings about the ways in which teachers set about developing their own expertise to do this work. 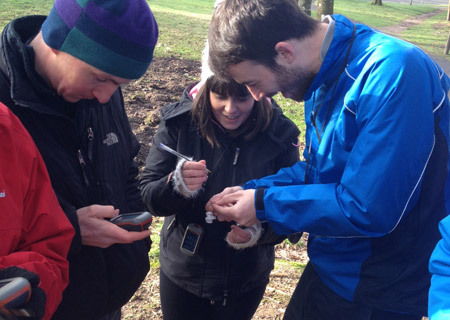 We have learned and developed many practical understandings too which helped us adapt geocaching to meet the local curricular needs of teachers and pupils in primary school settings. a. Setting. 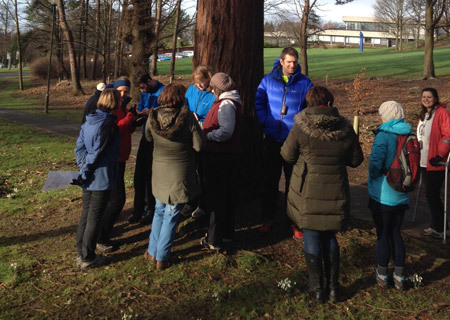 The university setting afforded opportunities to gather as teachers, and to share in the outdoor experience of geocaching in a diverse built and natural environment. b. Investing in User-friendly Technology. The project funding meant there was sufficient technology available (which would otherwise have been too expensive). c. The Peer-to-Peer Approach. We encouraged teachers, where possible, to share ideas with each other both on and off campus. d. Flexible Pace and Structures. We found teachers were committed to change but were trusted to engage with the task types at their own pace and in their own ways. Some involved pupils from the start in their work. Embedding the science came only after some level of expertise with the GPS and some level of comfort with being outdoors with pupils. The project has shown that using geocaching for inquiry-based science is entirely possible and very productive. Many of the practical elements of how to adapt geoaching for this use have been identified. Teachers evidenced that pupil engagement in learning was enhanced. There is scope for further developing the approach and for sharing findings with others so that other schools can do the same. We are progressing with a blog of our findings and documenting our work in more detail. All of the teachers spoke of their professional development and progress in inter alia the use of mobile technologies, the facilitation of outdoor learning and/or the teaching of inquiry based science in sustainability-focussed ways.